The rapid evolution of the IoT market has caused an explosion in the number and variety of IoT solutions. Additionally, large amounts of funding are being deployed at IoT startups. Consequently, the focus of the industry has been on manufacturing and producing the right types of hardware to enable those solutions. In current model, most IoT solution providers have been building all components of the stack, from the hardware devices to the relevant cloud services or as they would like to name it as “IoT solutions”, as a result, there is a lack of consistency and standards across the cloud services used by the different IoT solutions. Platform: This part includes the form and design of the products (UI/UX), analytics tools used to deal with the massive data streaming from all products in a secure way, and scalability which means wide adoption of protocols like IPv6 in all vertical and horizontal markets is needed. Connectivity: This phase includes all parts of the consumer’s day and night routine, from using wearables, smart cars, smart homes, and in the big scheme, smart cities. From the business prospective we have connectivity using IIoT (Industrial Internet of Things) where M2M communications dominating the field. Business Model: The bottom line is a big motivation for starting, investing in, and operating any business, without a sound and solid business models for IoT we will have another bubble , this model must satisfied all the requirements for all kinds of e-commerce; vertical markets, horizontal markets and consumer markets. But this category is always a victim of regulatory and legal scrutiny. Killer Applications: In this category there are three functions needed to have killer applications: control “things”, collect “data”, and analyze “data”. IoT needs killer applications to drive the business model using a unified platform. All four categories are inter-related, you need all them to make all them work. Missing one will break that model and stall the standardization process. A lot of work needed in this process, and many companies are involved in each of one of the categories, bringing them to the table to agree on a unifying model will be daunting task. 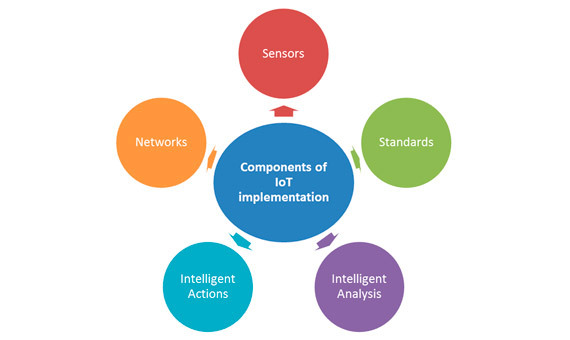 The second part of the model is IoT implementations; implementing IoT is not an easy process by any measure for many reasons including the complex nature of the different components of the ecosystem of IoT. To understand the gravity of this process, we will explore all the five components of IoT Implementation: Sensors, Networks, Standards, Intelligent Analysis, and Intelligent Actions. There two types of sensors: active sensors & passive sensors. The driving forces for using sensors in IoT today are new trends in technology that made sensors cheaper, smarter and smaller. But the challenges facing IoT sensors are: power consumption, security, and interoperability. The second component of IoT implantation is to transmit the signals collected by sensors over networks with all the different components of a typical network including routers, bridges in different topologies. Connecting the different parts of networks to the sensors can be done by different technologies including Wi-Fi, Bluetooth, Low Power Wi-Fi , Wi-Max, regular Ethernet , Long Term Evolution (LTE) and the recent promising technology of Li-Fi (using light as a medium of communication between the different parts of a typical network including sensors). The driving forces for wide spread network adoption in IoT are high data rate, low prices of data usage, virtualization (X – Defined Network trends), XaaS concept (SaaS, PaaS, and IaaS), and IPv6 deployment. But the challenges facing network implementation in IoT are the enormous growth in number of connected devices, availability of networks coverage, security, and power consumption. The third stage in the implementation process includes the sum of all activities of handling, processing and storing the data collected from the sensors. This aggregation increases the value of data by increasing, the scale, scope, and frequency of data available for analysis but aggregation only achieved through the use of various standards depending on the IoT application in used. There are two types of standards relevant for the aggregation process; technology standards (including network protocols, communication protocols, and data-aggregation standards) and regulatory standards (related to security and privacy of data, among other issues). Challenges facing the adoptions of standards within IoT are: standard for handling unstructured data, security and privacy issues in addition to regulatory standards for data markets. The Internet of Things (IoT) is an ecosystem of ever-increasing complexity; it’s the next weave of innovation that will humanize every object in our life, it is the next level to automating every object in our life and convergence of technologies will make IoT implementation much easier and faster, which in turn will improve many aspects of our life at home and at work and in between. From refrigerators to parking spaces to houses, IoT is bringing more and more things into the digital fold every day, which will likely make IoT a multi-trillion dollar industry in the near future. One possible outcome of successful standardization of IoT is the implementation of “IoT as a Service” technology , if that service offered and used the same way we use other flavors of “as a service” technologies today the possibilities of applications in real life will be unlimited. But we have a long way to achieve that dream; we need to overcome many obstacles and barriers at two fronts, consumers and businesses before we can harvest the fruits of such technology.